I got a nice trade package in the mail the other day from my buddy, Trevor. 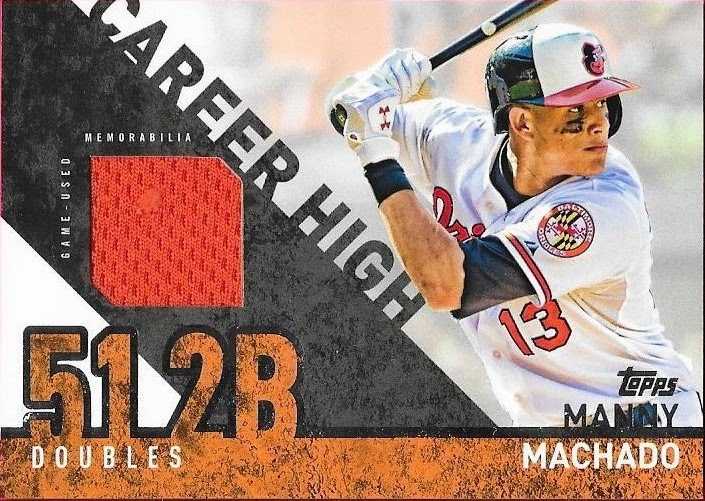 He got a bunch of nice Reds cards from me, and in return, I got this awesome Manny Machado relic card that has a snag on the jersey piece. Pretty cool card. I like these cards, and the flaw on the jersey piece makes it even cooler. I've done a lot more picking up of trade bait, recently. 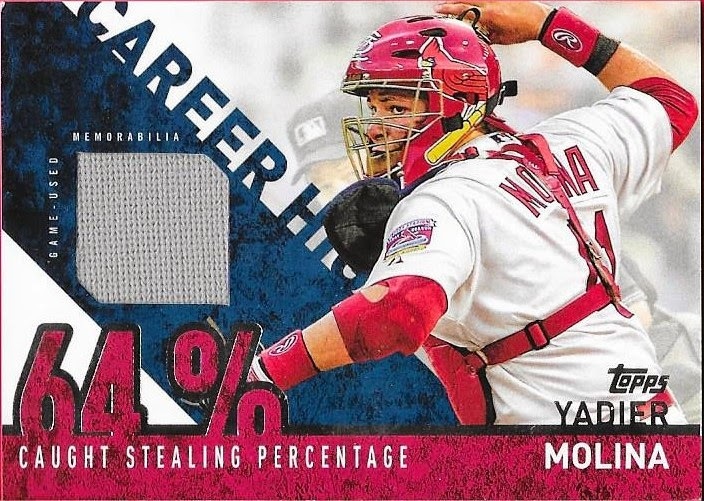 I got this Molina relic with the intention of offering it to my buddy, Andrew. He already has a deal he's working on with me, so this one may have to hold til the National. We'll see. Trevor added what I think is the entire Orioles team set of 1997 Pacific. I don't think I have this Cal in my PC, but who knows by now. The cards are really sharp, even though the names are tough to read on that foil. Yikes. Trevor sent me this Zach Britton gold parallel out of 2015 Topps that I needed to go along with my pink parallel. I might go for the rainbow of this card, but I'm not sure if I will. We shall see. Thanks so much for the deal, Trevor! I completed a trade with a kid named Gavin on Instagram that sent a Chris Archer auto and a Dominic Smith Sterling Auto his way. 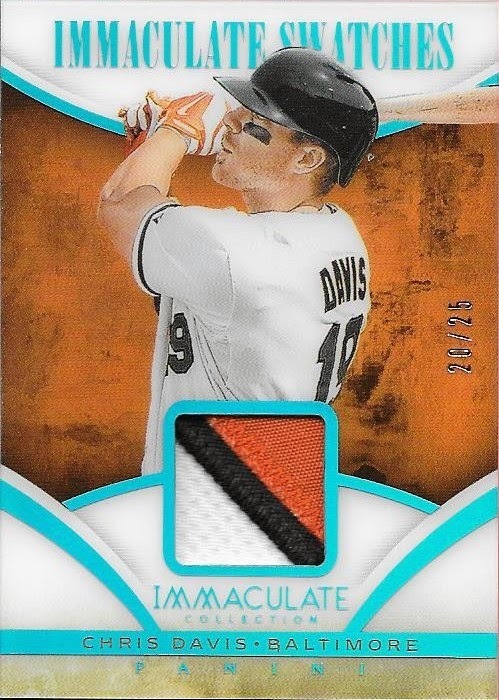 In return, I landed this awesome Chris Davis patch from 2014 Panini Immaculate. The card is numbered 20/25 and looks really cool in person. I really appreciated the deal, and was happy to add another Davis patch to my collection. The more and more stuff I pick up from Panini, the more I enjoy them. I will always be a Topps fan, but Panini really has some strong offerings that have come recently. My Davis PC really has blossomed over the last year. I like all of the patch cards that have come in and I feel like I can get a few more. Thanks for the deal, Gavin! My buddy, Michael, hooked me up the other day with a nice care package that had a few autographs that he thought I would like. 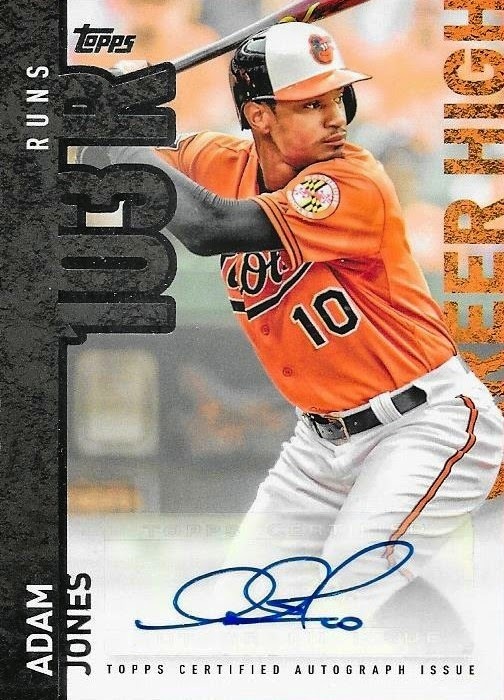 I really needed this 2015 Topps Career High Adam Jones auto in my Jones PC. The auto is nice and crisp, and looks awesome. 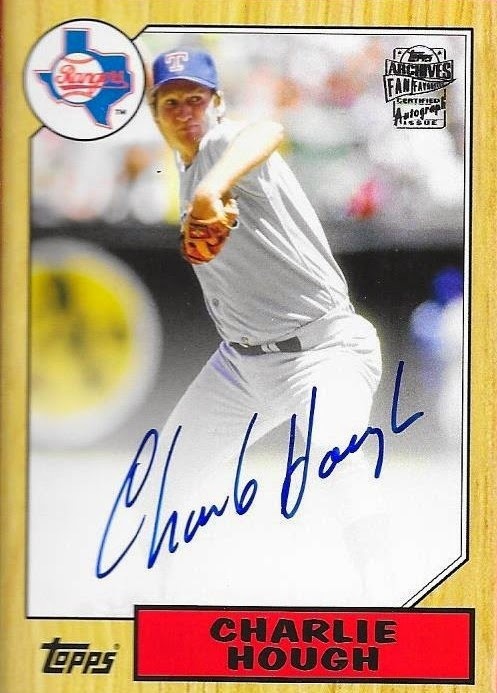 This 2013 Topps Archives Charlie Hough auto is really nice. On-card autos are great, and the 1987 design just makes it look really sharp. This was a cool card to get from Michael, for sure. 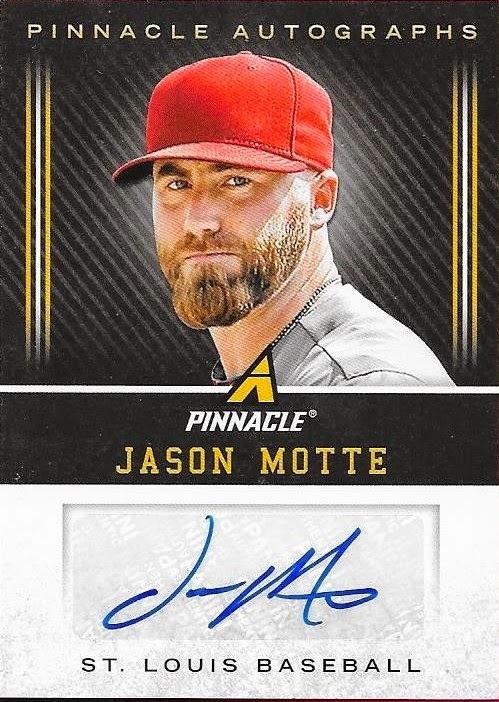 Surprisingly, when I posted on Instagram that I got this package, this Jason Motte auto was the most commented card in the group. I guess I know a bunch of Cardinals fans. 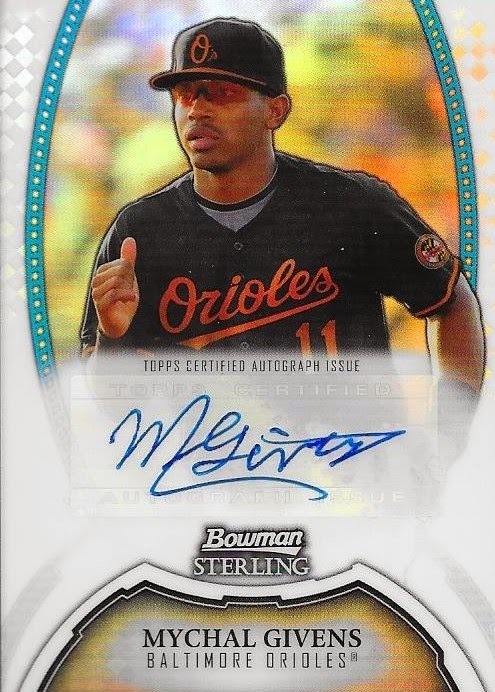 Finally, Michael sent me ANOTHER 2011 Bowman Sterling auto of Mychal Givens. 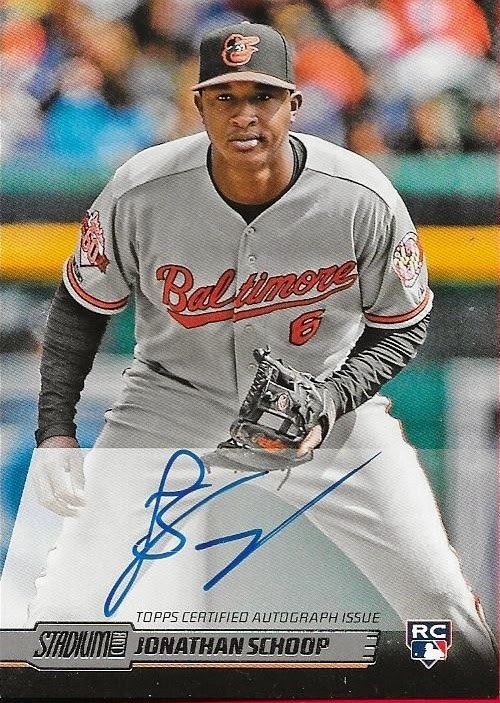 Givens is still a part of the Orioles farm system, having converted from an infielder to a pitcher. He has a shot to be called up from AA Bowie and work out of the bullpen. I'd like to see him make it. Thanks again for the care package, Michael. I always appreciate all that you do, far beyond the free stuff you give folks, but also the friendship you provide that is worth much more than baseball cards. My buddy Jack did some "pulls" a couple weeks ago for $5.00. What a "pull" is, is when someone dumps a bunch of cards into a box and for a price, they randomly pull out cards. I think I got 3 pulls with my $5, or something like that. I lost track once Jack pulled this Pete Rose auto for me. I mean, this awesome auto for $5? STEAL! The "pulls" concept is a pretty good one, I think. I've never done it, but if there are good chasers, then it would almost be attune to buying a pack of cards. I had no idea what was available, I just sent the money to help out a friend. Jack is a good kid, whom I have helped along with his collection. Thanks for the pulls, Jack, especially since I did so well! I recently entered a box break that my buddy, Weston, held over at his blog "Fantastic Catch." He busted boxes of 2008 Tristar Projections, 2008 Tristar Prospects Plus, 2011 Donruss Elite Extra Edition and 2012 Donruss Elite Extra Edition. Naturally, I picked up the Orioles and I also grabbed up the Cubs and Brewers to use as trade bait for a couple friends of mine (and also to help Weston fill the break). 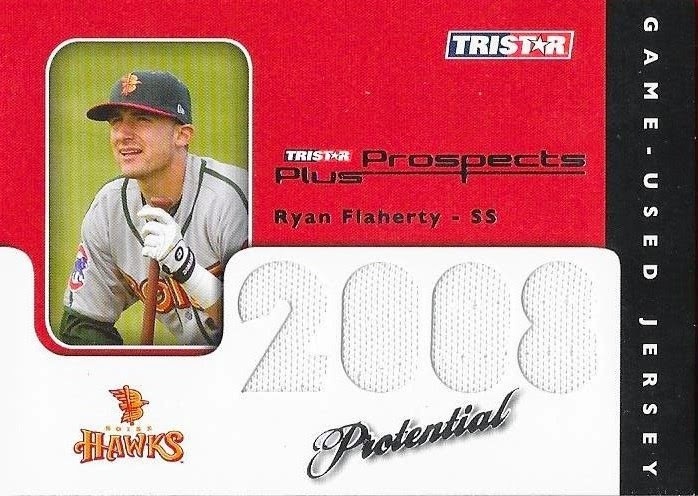 I feel like I did pretty well on the break, as I ended up with a sweet 4-piece jersey card of (then Cub) Oriole utility player, Ryan Flaherty. This is a really cool card, actually. I'm glad I ended up with it. "Flash" has had a decent career with the O's, especially since he was a Rule V pick that managed to stick with the club all season in 2012. He has filled in admirably for the O's when Manny Machado and J. J. Hardy have gone down to injury. 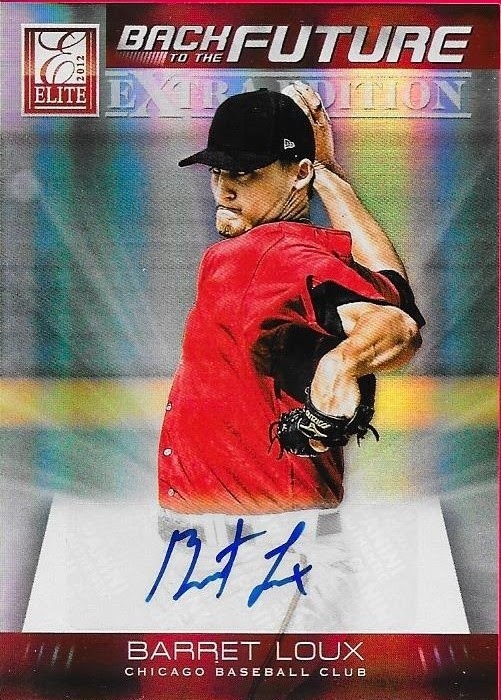 I got this nice auto of former Cubs prospect Barret Loux. He was a first round draft pick (6th pick overall) by the Diamondbacks in 2010. A check on baseball-reference shows that Loux hasn't played since 2013. I wonder what happened to him? 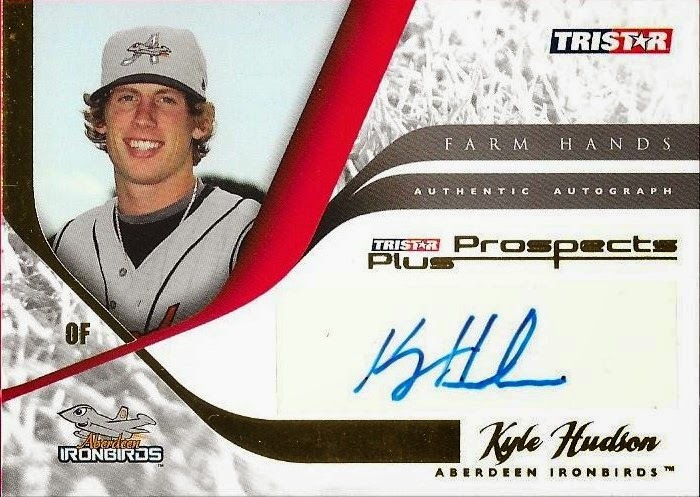 One of the former Oriole prospect autos that I got was this Kyle Hudson which is numbered 6/25. His last entry on baseball-reference says that he was released by the Angels on July 1, 2014. Another auto that I got was this Josh Vitters from 2008 Tristar Projections. 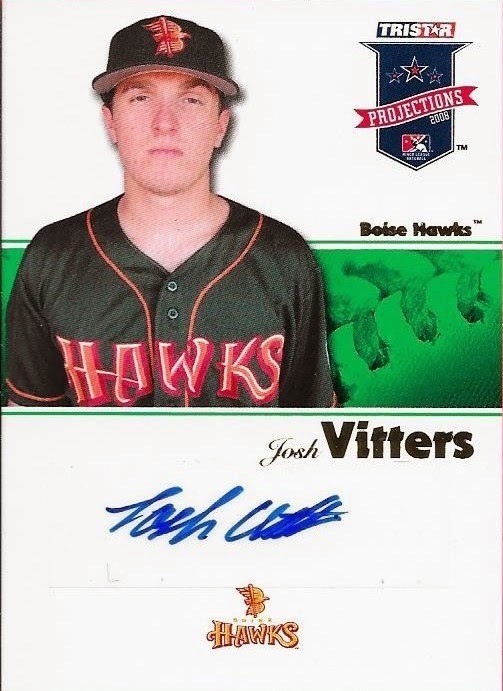 Vitters was a first round pick (3rd overall) in the 2007 draft and was picked up by the Rockies this past February. 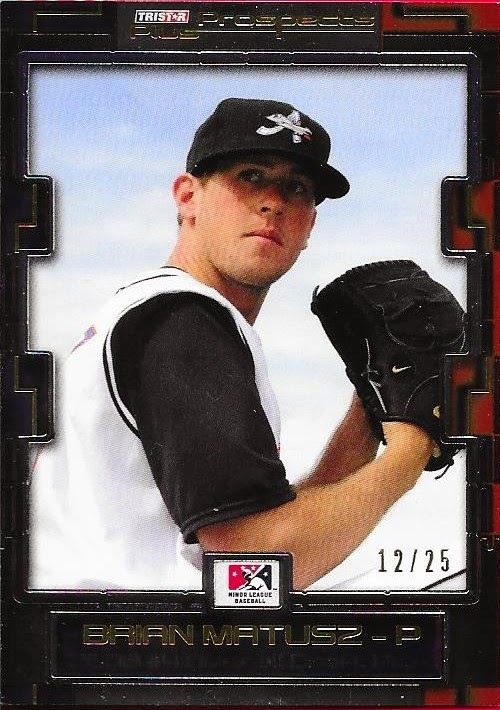 I got this nice 12/25 card of Orioles former first round pick, Brian Matusz. Matusz is a really nice guy, but I wouldn't trust him with the game on the line in the playoffs. He is likely to be traded before Spring Training ends, which will bring an end to a somewhat disappointing run in Baltimore. I really had hoped that he would make it as a top of the rotation starter, but it just hasn't worked out. 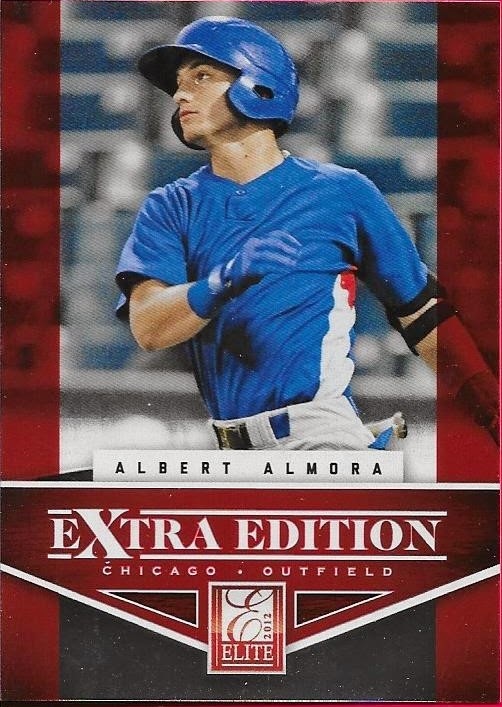 One of the Cubs cards I was able to pick up was this Albert Almora from 2012 Elite Extra Edition. Almora is almost forgotten with the emergence of Kris Bryant. At least, I haven't heard much about him with all of the Bryant drama going on. 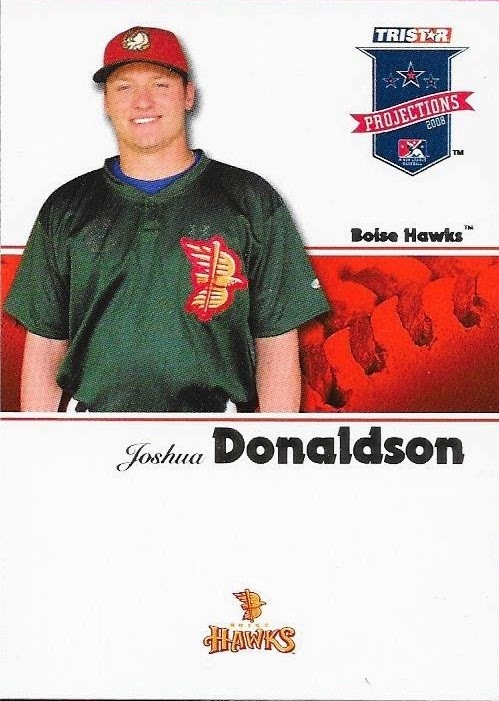 Finally, I got this awesome Josh Donaldson prospect card. I liked him when he was on the A's, but I can see him becoming a real thorn in my side now that he plays for the Jays. Thanks for the break, Weston! I'm glad I could be a part of it, and I hope you do another one soon! 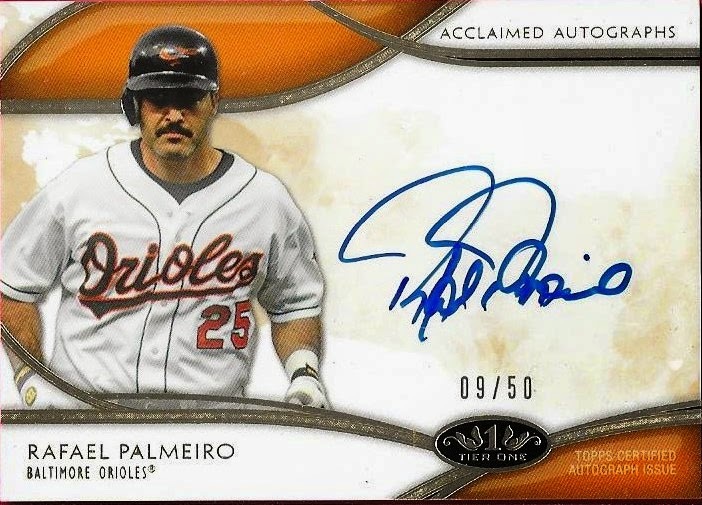 I completed a trade recently with my friend, Cameron that got me my first autograph of one of my favorite players growing up, Rafael Palmeiro. I won't get into the end of his career, which was a huge disappointment, but Raffy was one of the guys I really followed in my formative years in card collecting. My mom and I would go to the card shop near our house and the guy who owned the shop looked just like Raffy. We always joked about it, and that helped me follow Palmeiro throughout his career. I really like this card, and I'm glad I was able to get it from Cameron. 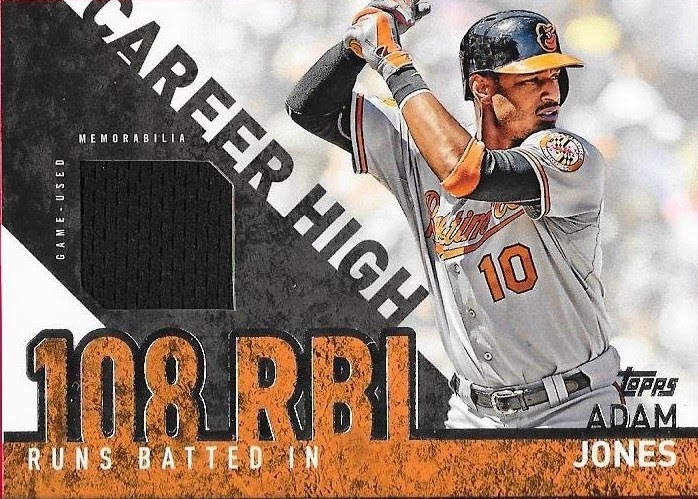 Cameron threw in this awesome Adam Jones relic from 2015 Topps that I needed in my collection. I sent Cameron an Austin Meadows auto, a Nelson Cruz relic and a Hanley Ramirez /99 card for this package. I really appreciate the trade, Cameron! Thanks man! I completed a trade recently with blog reader, Mark, when I sent him the Spring Fever Dustin Pedroia in exchange for a few 1969 Topps cards for my set. 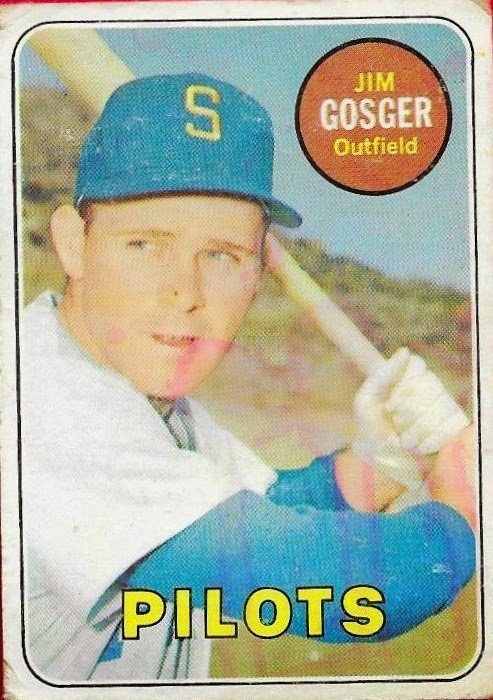 In those cards was the opportunity to post this Jim Gosger card, sporting a Seattle Pilots jersey. Always cool to see the old Pilots gear. I haven't done much lately with my '69 set, but I hope to knock some off of it at next weekend's card show. I don't have too many huge names remaining, I just have a bunch of cards to get. The high numbers are still hanging over me as well, so this one is going fairly slow. Thanks for the trade, Mark! I hope you liked the card I sent, and next time I get some more good Red Sox inserts, I'll send them your way! 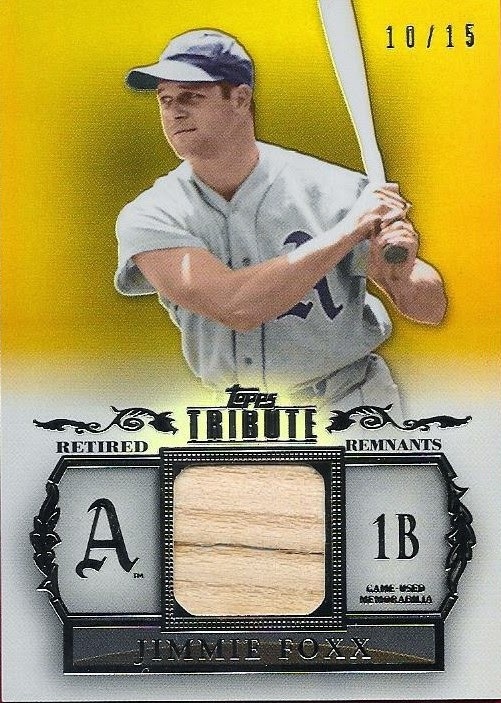 I got a deal on Instagram when I guy named Grant posted this 2013 Topps Tribute Jimmie Foxx bat relic card for sale a few days ago. I saw it, and that it was numbered to 10, so I immediately told the guy that I was interested, but I needed to wait a couple days because I had bought a few other cards over that weekend. He was nice enough to hold it for me, and notified me at the time I asked him to, and the card became mine! Having it in hand is a lot better than looking at it on a tiny phone screen. The card is flawless and came shipped inside a screwdown case. I don't normally care for screwdowns, but in this case, it will keep the card in the same condition and will be harder for me to take it out and hold it. I'm really bad about that. I don't have a lot of Foxx relics, so adding this one was nice. Each one I have is an amazing card, and my Foxx PC is pretty decent. My dream is still to own a Foxx auto (on a ball). Maybe I should start a crowdfunding campaign to get one, haha! A while ago, I got a care package in the mail from my buddy, Ben. In the package was a bunch of Orioles cards, many of which I needed in my collection. 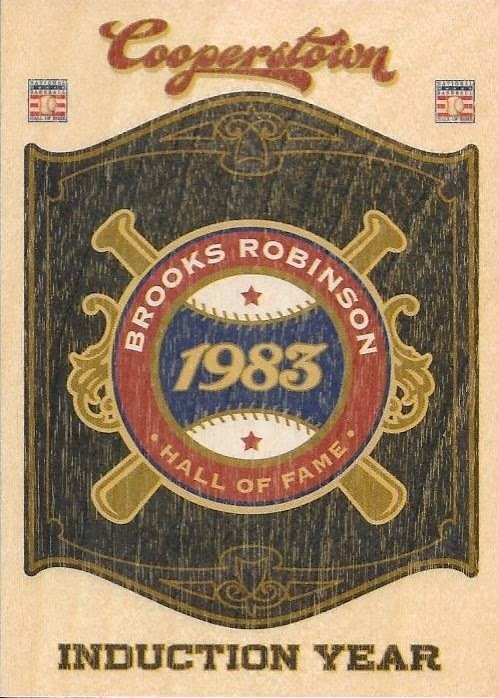 The above 2012 Panini Cooperstown Induction Year card of Brooks Robinson is really nice, as it is made of a thin piece of wood. I have the Walter Johnson version of this card, but definitely was pleased to have the Brooks added to my PC. I knew it existed, but I hadn't gotten one until now. 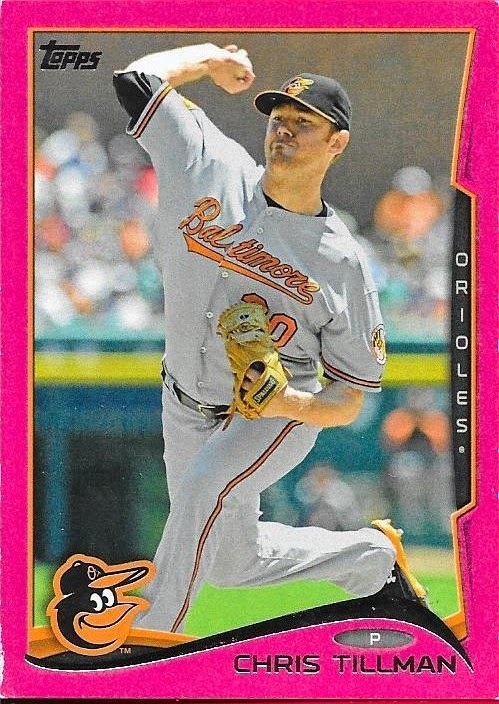 Another nice card that Ben included was this 2014 Topps Chris Tillman pink parallel numbered 30/50. I didn't have this one, either, and I don't have a whole lot of Tillman stuff. I had sent Ben several Orioles rally towels from Fan Fest for him and his family, and apparently, they were a hit. Ben is a really nice guy, and I'm glad we have connected over cards. Thanks for the package, Ben! Not too long ago, I got a care package from new blog reader and fellow blogger Julie. She writes the fantastic blog "A Cracked Bat: Baseball Cards and a Hot Dog", which I recommend you all check out, if you haven't already. Julie has also become one of the more prolific commenters on my blog posts, which is very appreciated. She sent me a nice package of Orioles stuff that I really liked, but overall, the above Adam Jones really stood out. Numbered 275/299, this 2014 Tier One is a really nice card to add to the collection. I usually overlook Jonesey when I am cruising for Davis stuff online and in trades, so when I get one in, it really helps me out. Julie also helped to knock a few emerald parallels off of my want list. I plan on adding more cards to this set, soon. I'm hoping I can find some at the upcoming card show that I plan on attending (and selling at, by the way. Come visit me.). I also feel like I can find a bunch of them at the National this summer. Thank you very much for the care package, Julie! I need to get something together for you soon! I am now down to five cards remaining on my 1948 Bowman needs list. After picking up these two cards from Sportlots, I can really see the light at the end of the tunnel. I sat down and priced out how much it would cost me if I bought each card I needed off of Ebay as Buy it Now and came to the conclusion that those 7 cards would be $171.50. I then went to a few other buying sites and saw that Ebay was the better marketplace, save for two of the cards. Those two, I found for a much better deal of Sportlots. The above Marty Marion was a real tough find for a decent price. The cheapest one on Ebay was $45, and it was in really rough shape. I got this one for $18 and it looks really good, except for some staining on the back. This Herm Wehmeier was $5.00 on Sportlots while comparable version was listed on Ebay for $10. I was glad to knock this one out as well, especially since I had initially made up my mind to only get the Marion, that is until I saw that this was from the same seller as the Marion (saving me on shipping). So, all I need now are 5 more cards and I can close out the '48 set after working on it for several years. I anticipate picking up a couple more in the next few weeks to narrow it down even more. The SPs and also the Enos Slaughter RC remain, but they will be mine before too long! 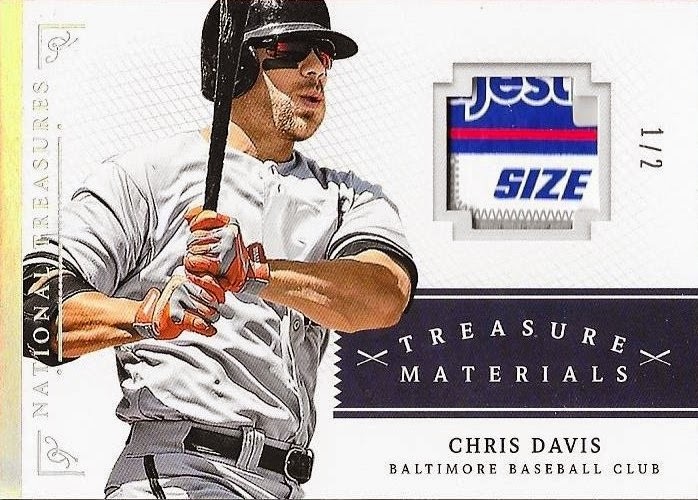 I got a huge steal from Ebay the other day that just came in when I got this Chris Davis Majestic tag card. Numbered 1/2, I was amazed at the price in which I landed it. This card is so awesome! I now own two tag cards of Davis. They're odd cards, for sure, but they're really cool. The fact that this one is only numbered 1/2 makes it even cooler. I hope you guys enjoy taking a look at this one, because I don't really have enough words to describe it. I need so many magnetic cases now, it isn't even funny. There is a guy on Instagram who hails from NC, just like I do, that I talk to every now and then about collecting. His name is Fred, and he goes by the handle 1steeleman. Fred and I haven't ever traded before, but we talk about it a lot. We just haven't ever really pulled the trigger on a deal, especially since Fred is a big fan of vintage, and it is really hard for me to part with any significant stuff from that era. While Fred and I have chatted, I have determined that he is a really good guy. I think he might be a couple years older than I am, so he is one of the few adults on Instagram, at least from what I have seen. With him being from NC, I'm certain that we will be meeting in person much sooner rather than later, especially if I go to and of the upcoming card shows in the area. Anyway, Fred surprised me with a care package the other day saying that he appreciated what all I did for the card community and also to help keep the NC collecting strong. I wasn't expecting this card, however, when I opened the package. 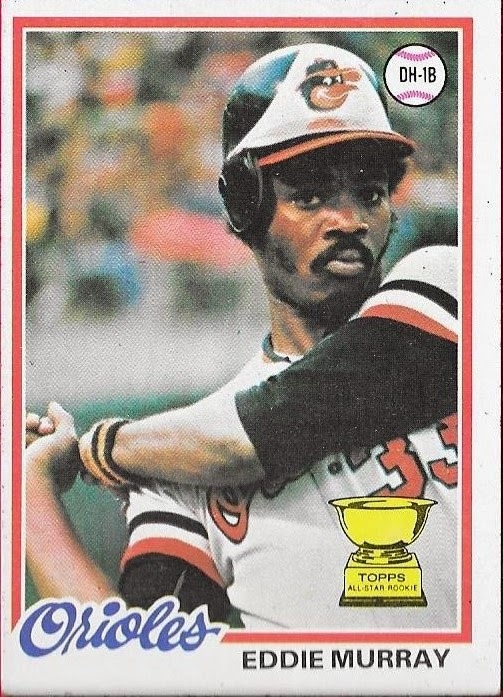 I was really excited to see this Eddie Murray RC inside the padded mailer. Going back to my post about Ryu the other day, and now this one about Fred, I really am happy that I am a part of this community. That's what we are, a community. Sure, there are some folks in it for the money, but when you can look past those folks and find a Fred who gives without thought of reward, well, that really makes this a great place to be. I can't wait for the day to meet him in person and shake his hand. Thank you so much for the card, Fred! I really appreciate it, and I hope to be able to find something good for your collection one day. 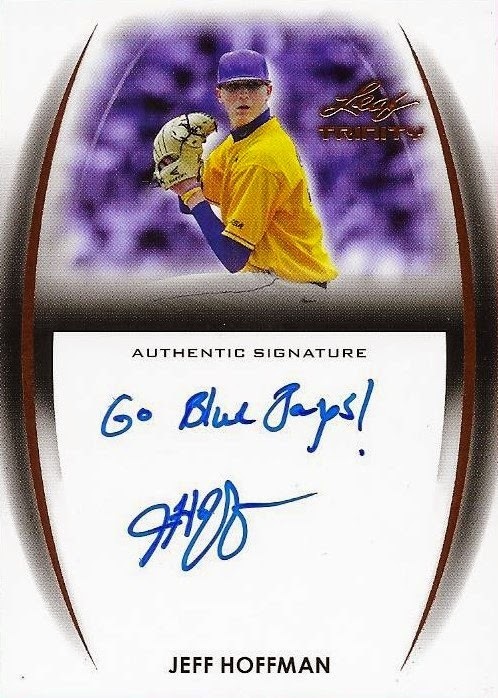 I picked up this really cool auto of former ECU pitcher, Jeff Hoffman, off of Ebay recently for a steal. I paid $6.01 shipped for this card for the sole reason that he was wearing his ECU jersey in the photo. I live about 5 minutes or so from ECU and while I didn't attend the school, I do follow them now that I live in the area. I haven't been able to make it to many of the games, especially since Chris's baseball has started up, but I have been to a couple since I moved here in 2009. 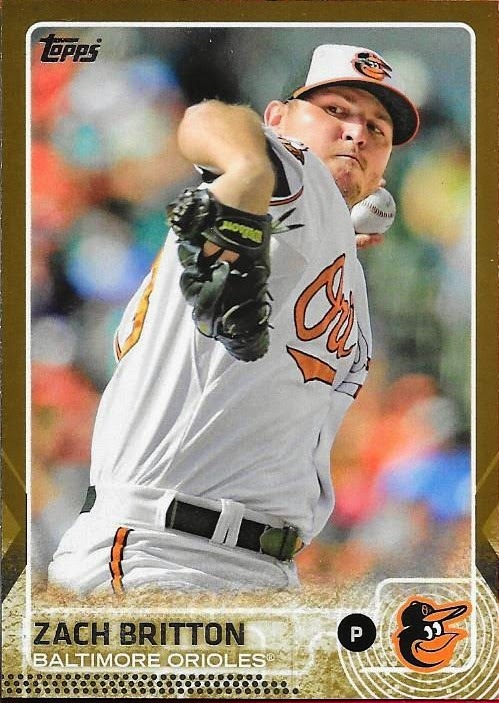 Anyway, I was really happy to get this card and will hold onto it as we all watch to see if Hoffman can develop into a major league pitcher. Back in February, I posted part of an awesome surprise care package that I got from blog reader, David. He helped me complete my 2014 Topps Chrome set, which was really appreciated. You can read that post here. Along with the chrome cards that I needed, David also added a bunch of Orioles that I needed in my collection. 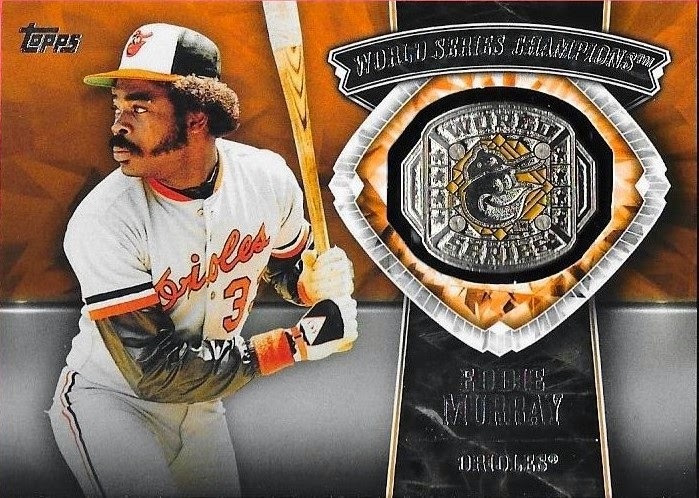 The above Eddie Murray 2014 Topps manufactured World Series Ring card was something I truly wasn't expecting. The card looks awesome, and I can never have enough Murray stuff. Also, who doesn't love those sideburns? 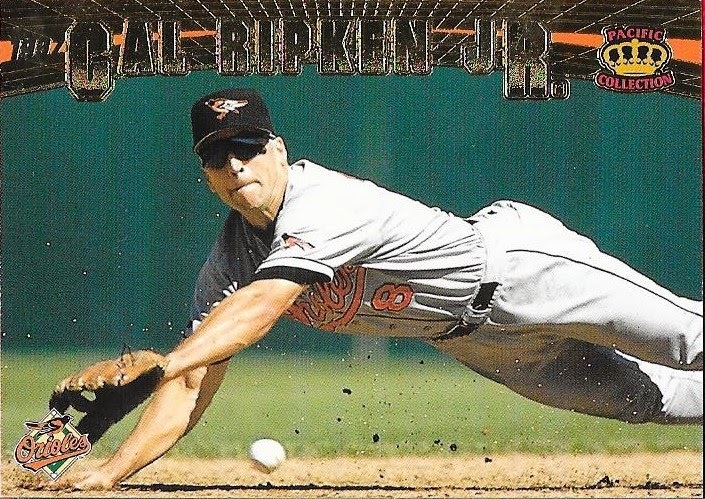 David also joins the rare club of someone who was able to find a Cal Ripken card that I didn't have in my collection. 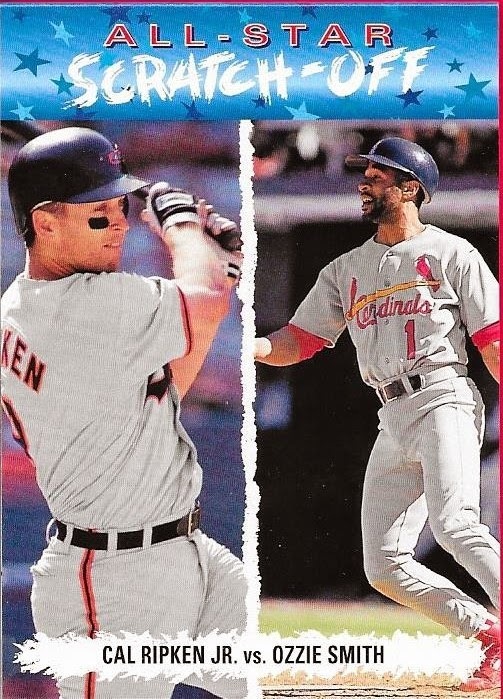 This All Star scratch-off card came from 1993 Upper Deck. I don't know how this one escaped me for so long. Doesn't matter now, because I have it! Finally, David included this 2014 Stadium Club Jonathan Schoop on card auto. I already had one, but was happy to get another. I look for Schoop to have a breakout year, this year. His defense is really good; his bat just needs to catch up! Thank you for the care package, David! If I can ever help your collection out, please let me know! I have been talking to a young man from Instagram over the last few months named Ryu. He lives nearby, just outside of Raleigh, NC and we have struck up a friendship by discussing cards, trades and card shows. Ryu is a huge fan of Japanese baseball players, especially Nori Aoki and Ichiro. I had an Aoki golden parallel RC from 2012 Topps that I dropped in the mail for him, since I had seen it in a pile the night before we met. I figured, since I knew exactly where I had laid that card, then meeting Ryu, who was a huge fan, he was meant to have that card. A lot more talks ensued, and I felt that Ryu was a really good kid, and I wanted to do something nice for him. So, I bought him an Ichiro RC from 2001 Topps, thinking that he should at least have his guy's RC in his collection. I figured that it was a nice gesture and all, but it was just a baseball card. I didn't realize just how much a simple gesture would mean to a kid, when I got a package in the mail from Ryu this afternoon. 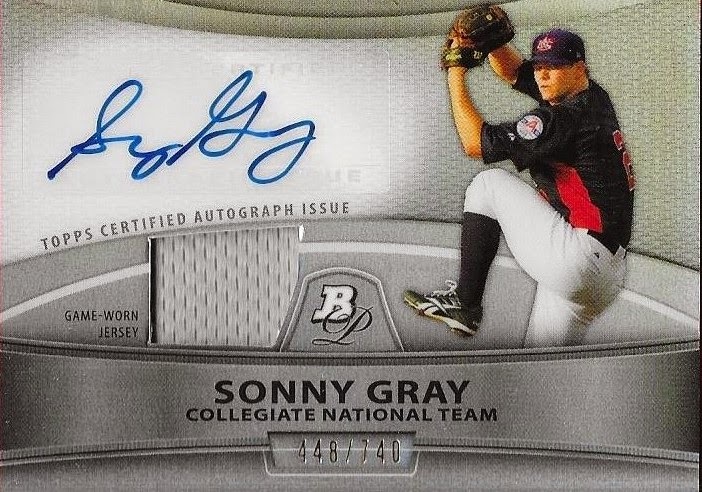 Inside the package was this amazing 2010 Bowman Platinum relic/auto of my new PC, Sonny Gray. Equally as amazing was the almost 3/4 page letter from Ryu, complete with a header that he wrote at the top with one simple word: Surprise! I'm not going to repeat much of what was in the letter, except one line: "I love each and every card you have sent me..."
I have been a part of the card community since I started this blog in November 2008; well, even before that, really, when I was helping at the card shop and people like Babe, P. A. and Pete with their generosity teaching me that it isn't about how much money you can make off of the cards. It is about enjoying the collection that you have, and being able to take some of the things that you might not need and giving them to someone who will love them. Seeing how happy I made a young person when he received a golden parallel of his favorite player, or a rookie card of a future Hall of Famer, and also knowing that the person looks up to you and the example you set, well, that is what this community is about. Ryu is a really awesome kid. I knew that before he sent me this awesome card. I've made sure to tell him as well. I wish and hope that more young people were like him and would work to make this community even better than it already is. Thank you so much, Ryu. I am blown away by this card, and the gesture. I will never forget it! I got a nice package of stuff in the mail the other day from my good friend, Joey. I sent him a bunch of Red Sox cards and a Phil Niekro Sweet Spot bat auto. In return, Joey sent me a stack of vintage stuff (mostly Bowman) that he had. 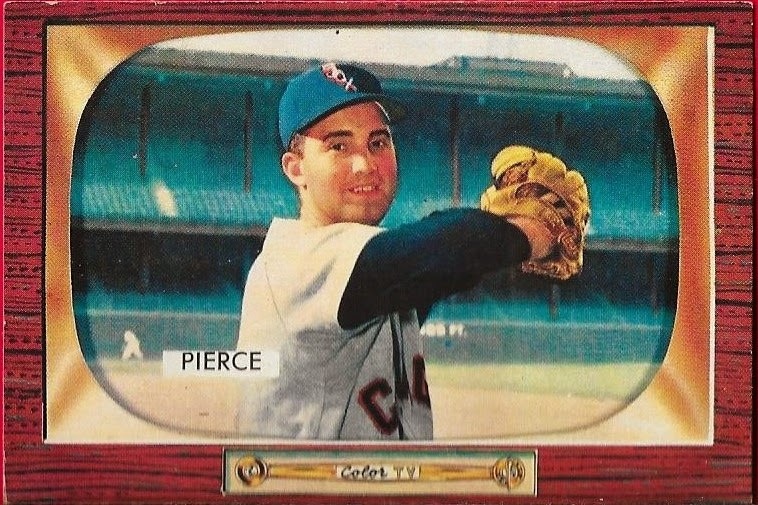 This 1955 Billy Pierce might be the best card in the bunch. I took it out of the top loader and was amazed at the shape that the card was in. There was still a great deal of gloss on the card, and the edges and corners were really sharp. 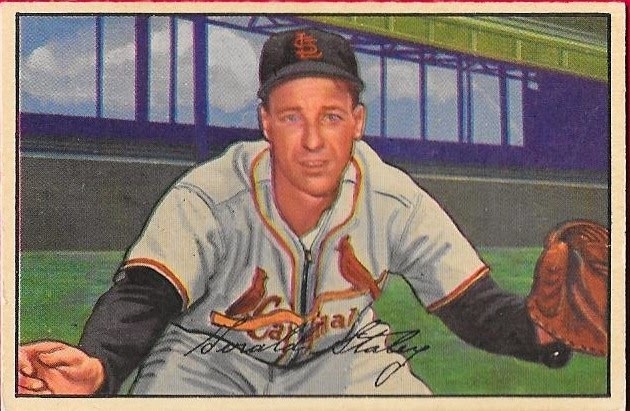 This 1952 Bowman Gerry Staley is also in great shape. I love the '52 design. Once I finish my 1948 Bowman set, I may consider doing another one of their sets. It will be really tough to decide which one, though. This Joe Adcock card was a little rough, but still was really cool. Adcock was a great player in his day, but is always overshadowed by his teammate, Eddie Mathews and later by Hank Aaron. He had a really good career, clubbing 336 homers, but his other stats don't really stand out. Doesn't matter, though, this is still a really awesome card. Finally, I got this quad relic card from Joey pretty cheaply since there is a good bit of damage on the card. 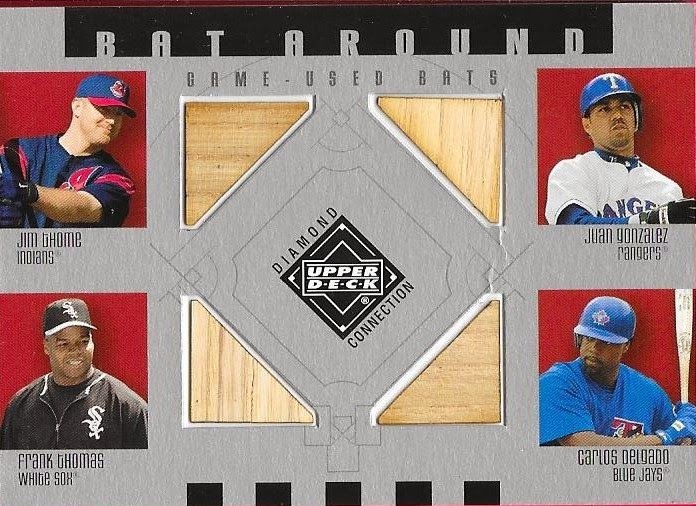 It is a quad bat card of Thome, Thomas, Juan Gone and Delgado. One of the guys on the card is already a Hall of Famer and another (Thome) will be. The other two guys could make a case for themselves, but I highly doubt they ever get in. Oh well. It still is a really cool card. Thanks for the deal, Joey! I really appreciate it and I know we will do a bunch more in the future! 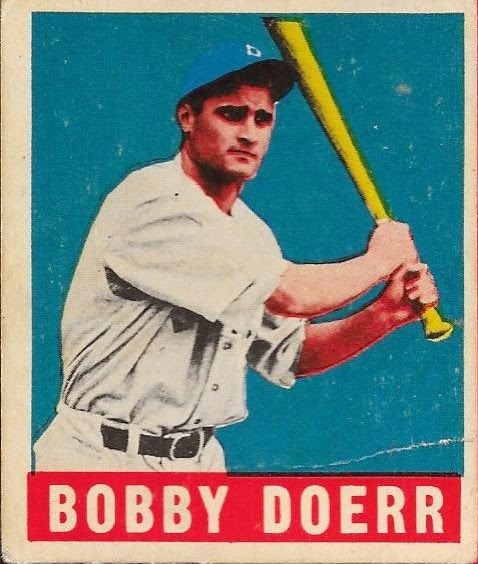 I picked up a card from my top ten wishlist recently when I got this 1948 Leaf Bobby Doerr from Ebay. I have been wanting one of these for a while; I really like the coloring of the cards. This makes the second 1948 Leaf that I have, my Virgil Trucks RC being the first. I believe this is the only card I have of Doerr from his playing days. 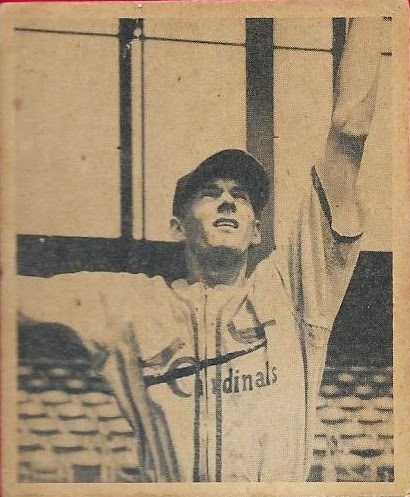 Doerr is the last living player who had played in the 1930s. I've had a few people tell me that I should send this TTM to Doerr, but I have gotten him a few times, and I would really like to keep this card as is. You can see that there are a few creases, but they don't take anything away from the card at all. The back is clean as well. I've done a good job so far working on my goal for this year. I've now knocked off three cards from my top 10 wishlist. Hopefully, I will be able to grab a few more of them at the National Card Show in July. I completed another great trade with my friend, Blaine, on Instagram when I sent him a ball signed by Jim Palmer in exchange for this Monte Irvin 1953 Topps. The card is in pretty good shape, with the exception of a few rounded corners. 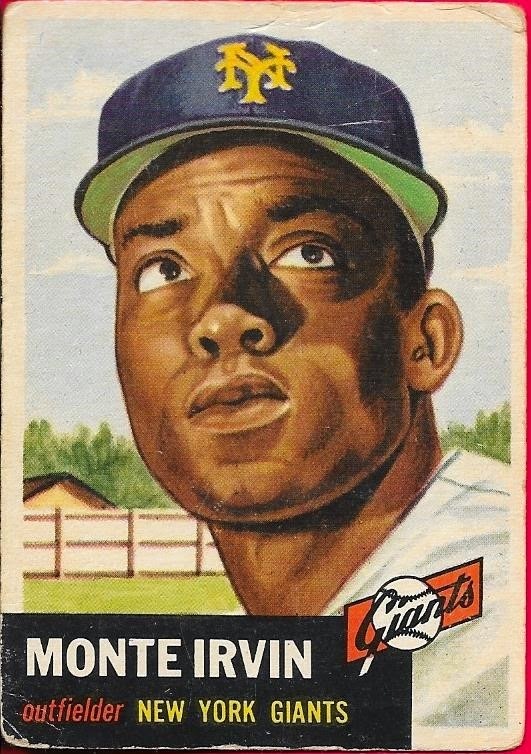 I think the '53 design is one of the great ones in Topps's history, and this card might just exemplify that. 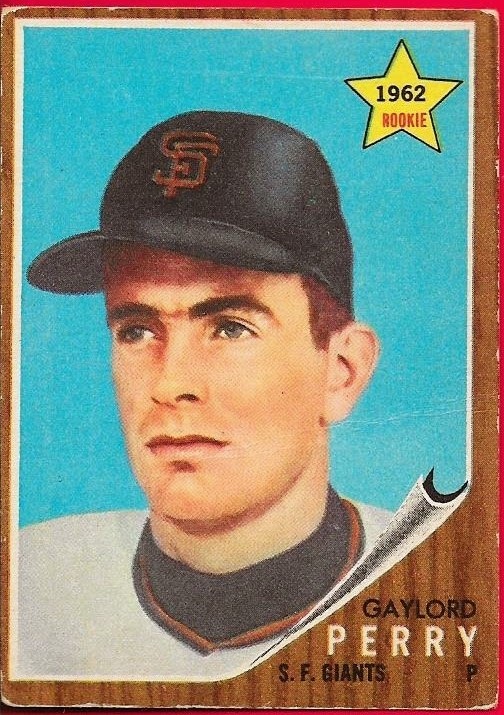 The other big part of our deal was this 1962 Topps Gaylord Perry RC. I already have Perry on a ball, and now I can say that I have his rookie card as well. 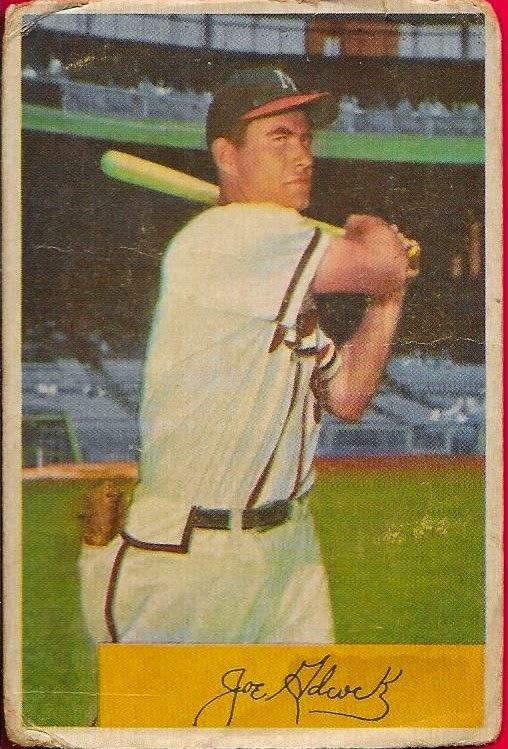 I also have his 1963 Topps "rookie stars" card as well, but this '62 is his true rookie. Thanks so much for another successful trade, Blaine! I'm excited to think of what we could exchange next! I did some buying on EBay recently and a few of the items have come in over the last few days. Instead of burying them in my "to be blogged pile", I figured I would combine them and try to move a few things along. 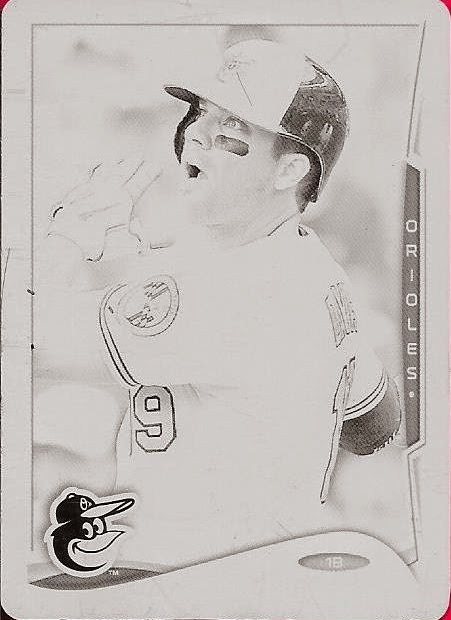 The above 2014 Topps Mini printing plate of Chris Davis was on my watch list for a while, so I went ahead and picked it up for $16 shipped. Not bad for a plate. I wish it was the checklist version, though, since I have the platinum 1/1. 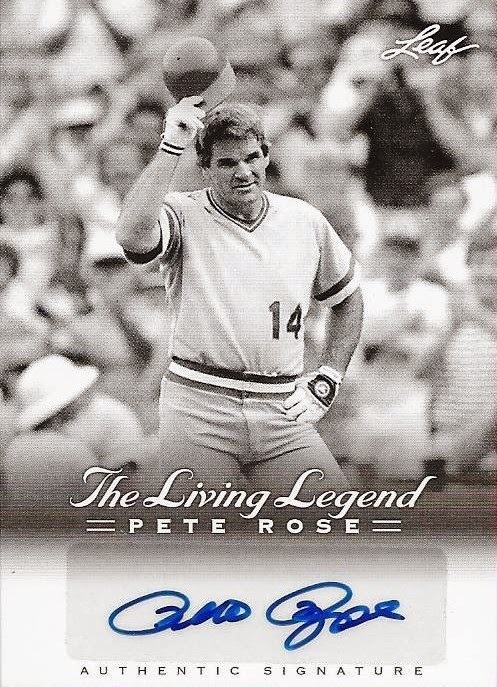 Oh well, I'm hoping I find it, or the platinum 1/1 of this card. 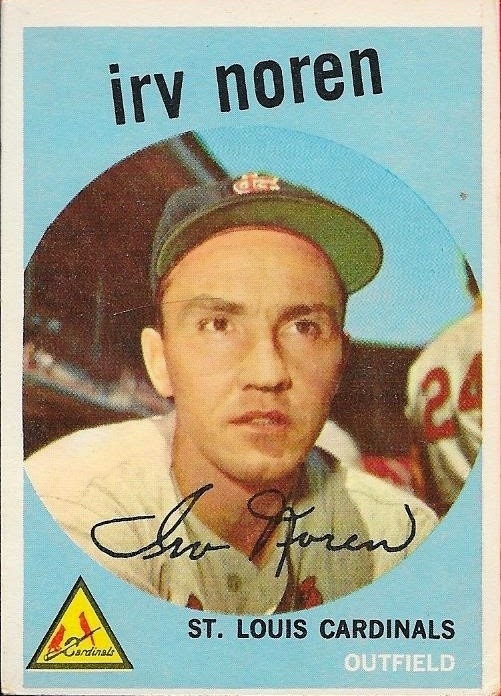 For a couple bucks, I grabbed this Irv Noren from 1959 Topps. This is card #59 and was actually very hard to search for until I figured out who was actually on the card. It's in great shape and will go nicely into my set. I am under 100 cards remaining for this set, and I really would like to finish it off this year. 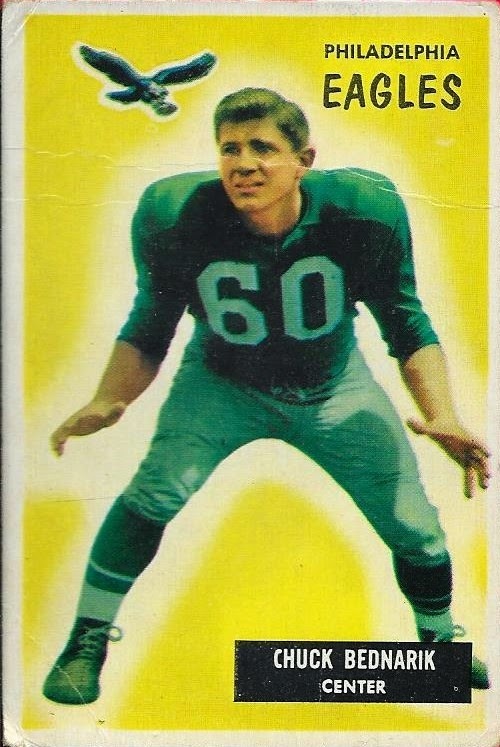 I bought this 1955 Bowman Chuck Bednarik football card with the hope of sending it to him for a TTM autograph, but he sent it back to me RTS. Oh well, I went to the well too many times on him, since I was successful a few years ago. He has been up and down health-wise lately, so that is more important. I hope he is doing well, as he is 89 years old now. 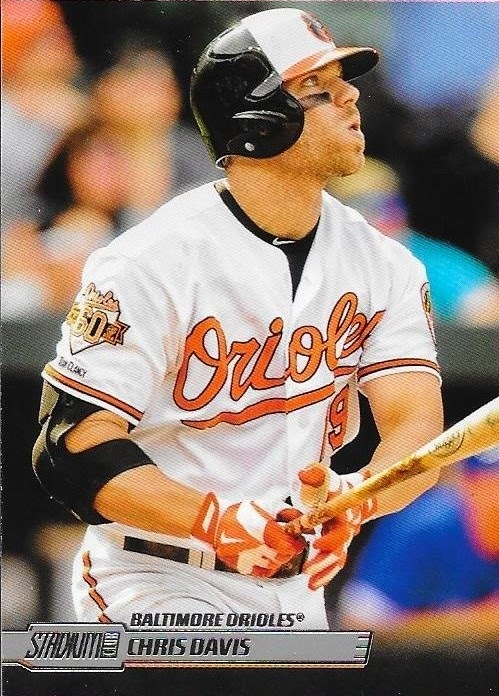 Finally, I needed this 2014 Topps Stadium Club Chris Davis for my PC, so I got it when I bought a few of his other cards a while back. It was at the bottom of my pile, so I was happy to go ahead and get it scanned and posted. I love Stadium Club, and this card of Davis is a real nice one. I just wish he would stop with the chewing tobacco. I picked up a few 1948 Bowman cards off of Ebay recently after I sold a Mookie Betts auto for $30 to a guy on Instagram. 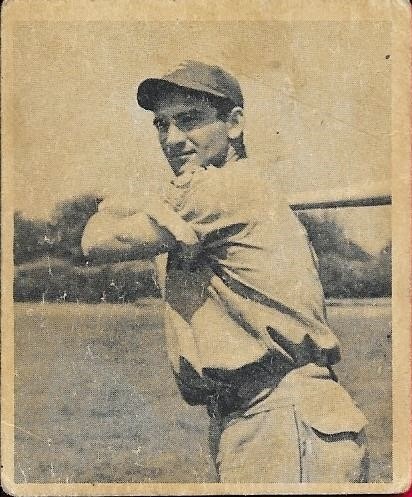 I got this Tommy Henrich card at around $7 because the seller had its condition marked as "poor." 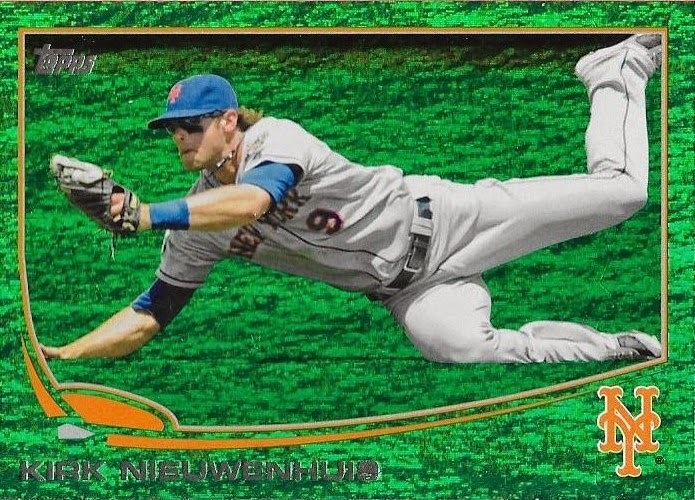 I can see the crease on the card, and the centering isn't that great, but I would never grade it as poor. I have a lot of respect for Henrich after reading about him a few years ago (I forget which book, it was either We Played the Game or The Glory of Their Times). I picked up a ball signed by Henrich in Cooperstown back in 2013. 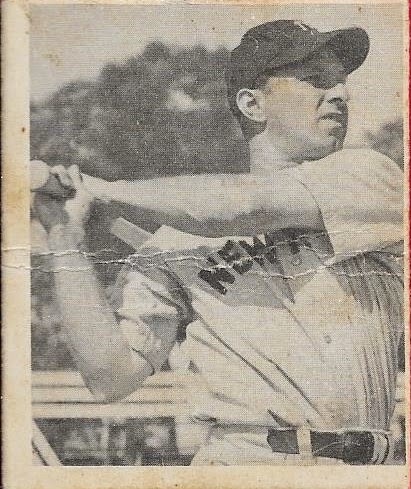 Here is card #27, Sid Gordon. Gordon seems like he was a pretty decent ballplayer. 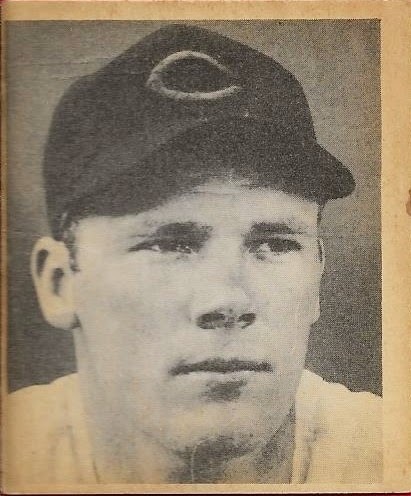 He was a 2-time All Star and hit 30 home runs in the 1948 season. Not bad, I think. 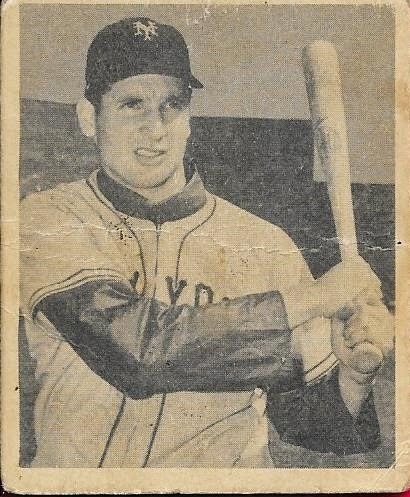 Finally, I added this Bobby Thomson RC. Thomson is famous for his "Shot Heard Round The World" home run in 1951 that gave the Giants the NL pennant over the Dodgers. Adding these three cards puts my set needs at 7 cards remaining. I never thought I would be this close to finishing the set. It really is just one Ebay binge away from being done. The last big name I need is Enos Slaughter. A Hall of Famer, sure, but Slaughter isn't mearly as big a name as the ones that I have chipped away from this set since I started it a few years ago. I'm hoping I can get this one wrapped up in a few months, that way, I can go into the National Card Show in July with one less set hanging over my head. My good friend, P. A. is in Greenville for the evening, so we met up for some showing off of cards and good old-fashioned baseball talk. P. A. had a huge box of stuff he brought for me that I took delivery of that will help in a lot of facets of my collection. There were a bunch of cards that he gave me but there was one card in particular that he was really excited about sending my way. 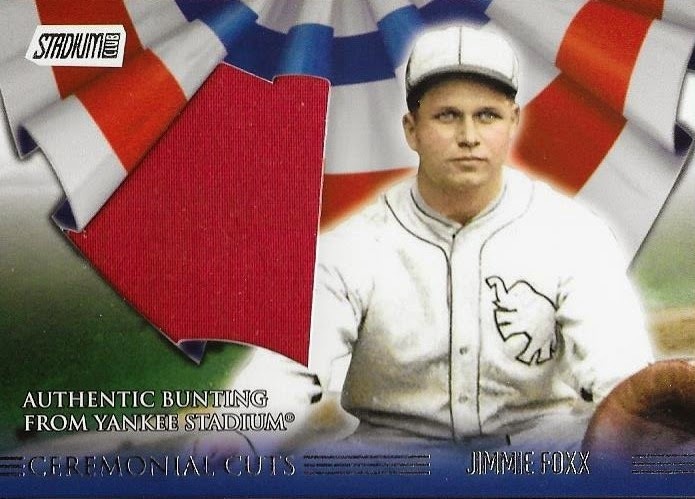 This 2008 Topps Stadium Club card of Jimmie Foxx is really awesome because it contains a piece of bunting from the old Yankee Stadium. 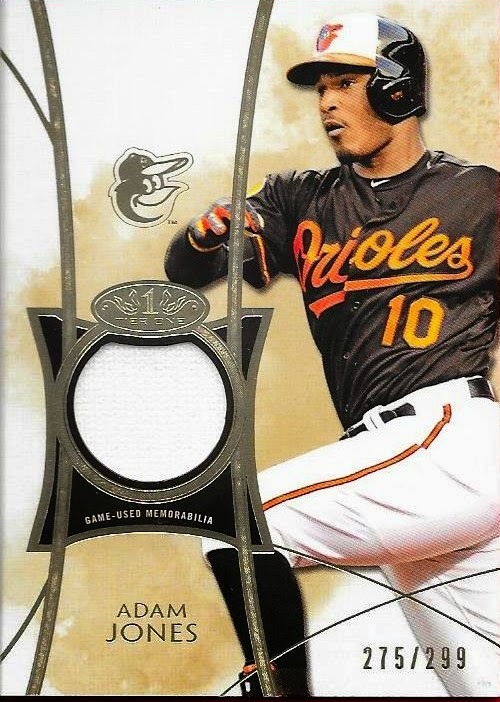 I remember when 2008 Stadium Club came out, P. A. was a huge fan of it right away and came into the old Winston-Salem card shop that I was "working" at and bought a box. He busted the box with me at one of the tables and pulled this card. I remember both of us being really excited that he pulled it, not knowing at the time that I would begin a PC of Foxx a few years later. This card is really amazing. I was so surprised that P. A. was willing to part with this card, and even more surprised that he gifted it to me. Thank you so much for the card, P. A. I appreciate it so much. 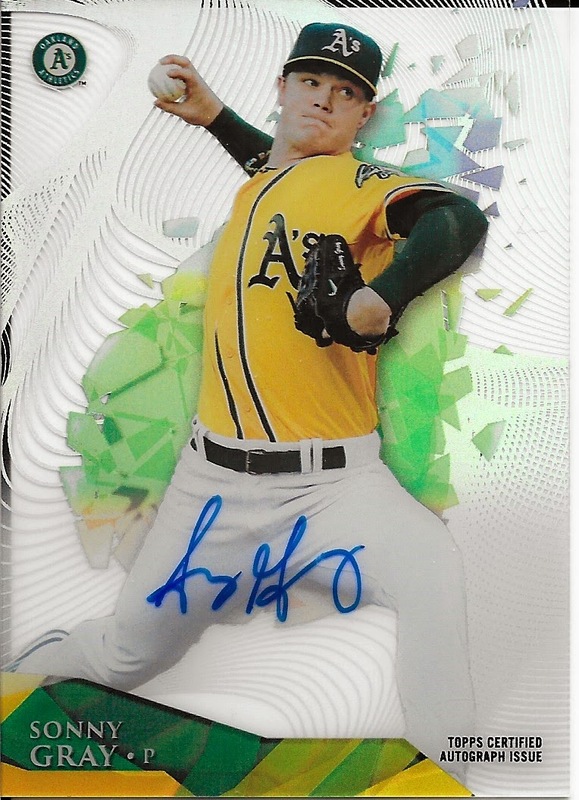 I completed a trade with my friend, Noah, a while back when I sent him a bunch of Tigers stuff in exchange for this Sonny Gray auto from 2014 Topps Hi Tek. This is the third auto that I have gotten from that set, along with my Cespedes and Taveras. The autographs on these acetate cards really look awesome. They leek even better when slabbed in a magnetic case. The green and yellow of Gray's jersey really stand out as well! I just love these cards. Thanks for the deal, Noah, I'm glad we were able to hammer it out!